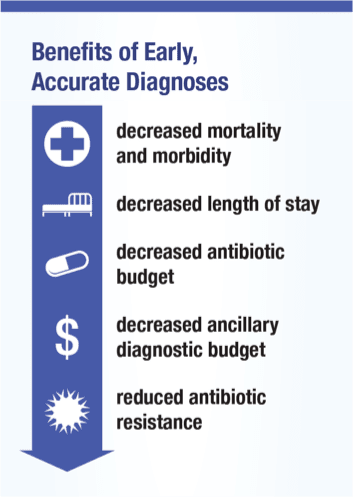 of infection in suspected sepsis patients. By testing whole blood directly, the assay is able to detect the response of the patient’s immune system to an infection earlier, faster and more accurately than finding the pathogen. on finding and characterizing the invading pathogen. Finding and characterizing the invading pathogen is often slow with no identification in the majority of suspected sepsis cases. that is reliably detected by SeptiCyte™ technology. How to improve accuracy and accessibility to rapid clinical test results? Do not focus only on identifying the pathogen. of patients suspected of sepsis by using the specific host response. Immune cells contain large amounts of RNA – a measurable genetic material that is a snapshot of the immune conversation. 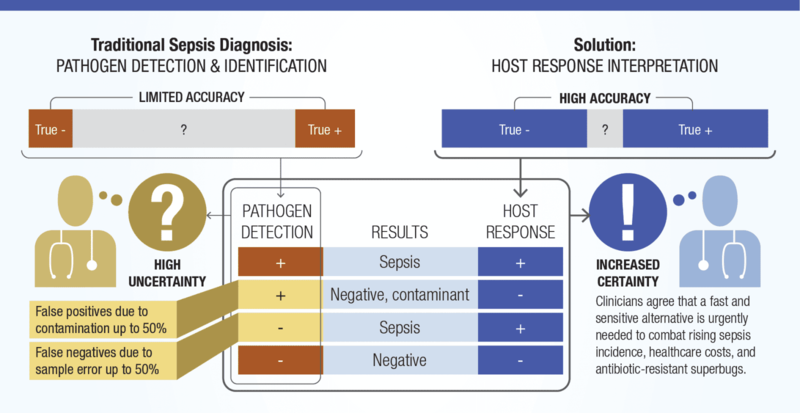 Using mathematical algorithms, patient’s genetic material from the septic immune response is rapidly analyzed providing actionable clinical information in 100% of suspected sepsis cases. Immunexpress’ SeptiCyte™ LAB is the only FDA cleared test for the management of sepsis using the patient's genomic response to infection. Multi-national clinical trials have shown SeptiCyte™ to be the single most accurate test for the diagnosis of sepsis. from a host response assay WITH pathogen information. SeptiCyte™ host response results allow clinicians to better interpret positive and negative pathogen results. measuring the host immune response. Claims include biomarkers, algorithms, analysis methods, treatments, compositions and kits. herpes and protozoal infections, and differentiating pathogenic bacteria. including random access, point-of-care (POC) and sample-to-answer. in critically ill patients on their first day of ICU admission. 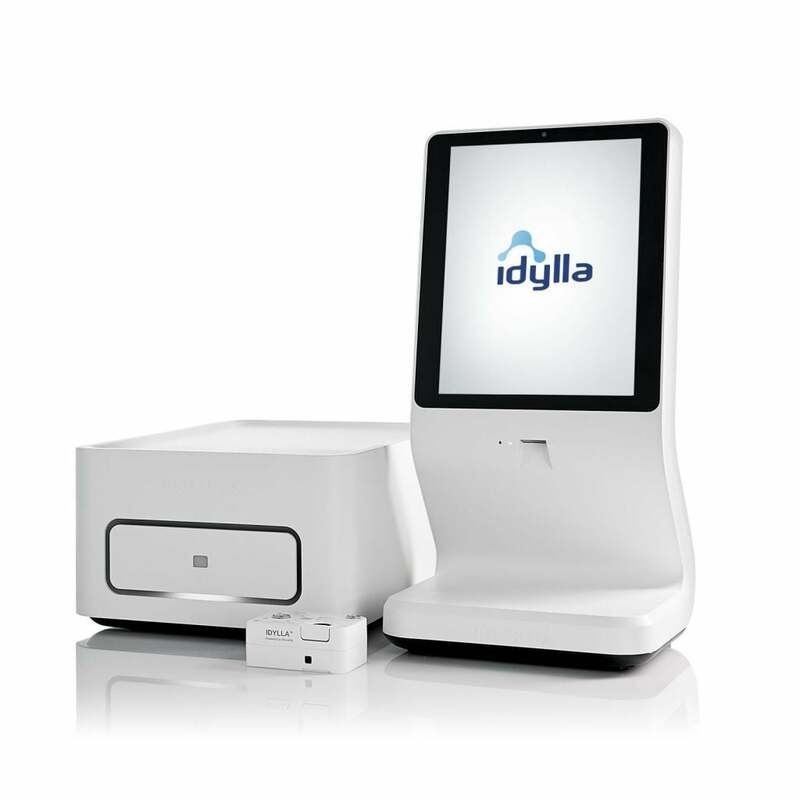 In Jan. 2018, Immunexpress entered into an agreement with Biocartis to develop and commercialize Immunexpress’ SeptiCyte™ test for use on Biocartis’ sample-to-result Idylla™ platform. The collaboration promises a fully-automated, rapid near-patient host response test that quickly provides accurate life-saving clinical information.